A version of this article was originally seen on MediaPost. They say language is a window into different worlds – it is a reflection of ourselves, cultures, perspectives, traditions, norms, and relationships. It is a tool we use to understand one another, even if we aren’t always consciously thinking about the words we exchange with people each and every day. But in my role as Head of Content for Dynamic Yield, it is my job to constantly think about and carefully dissect exactly how a business communicates. I recognize the power language wields in shaping the way individuals, industries, and even societies perceive a brand. This makes the work I do with words both incredibly terrifying, while also truly rewarding – I know, call me an adrenaline junky. Recently, I had the pleasure of evaluating, re-defining, documenting, and disseminating a whole new set of guidelines constituting how the company talks about itself as well as its products and services. As part of a nearly year-long rebranding project, this linguistic identity would become the crux of major design decisions, make its way across all of our digital properties, pour into various areas of the business, and even help reshape the company culture. Now, a few months into our new brand, I thought I’d share my experience and some of the impressive results we’ve seen already. There were various levers that needed to be pulled, so I’m hoping this post acts as a reminder of just how powerful language can actually be when it comes to marketing – both internally and externally. A style guide encapsulates many different components, each integral to ensuring consistency and cohesion. Without it, each individual becomes the purveyor of the brand, making decisions based on personal judgment about how it sounds. The purpose of an effective style guide is to weed out all of the undesired tendencies in communication and plant better habits. 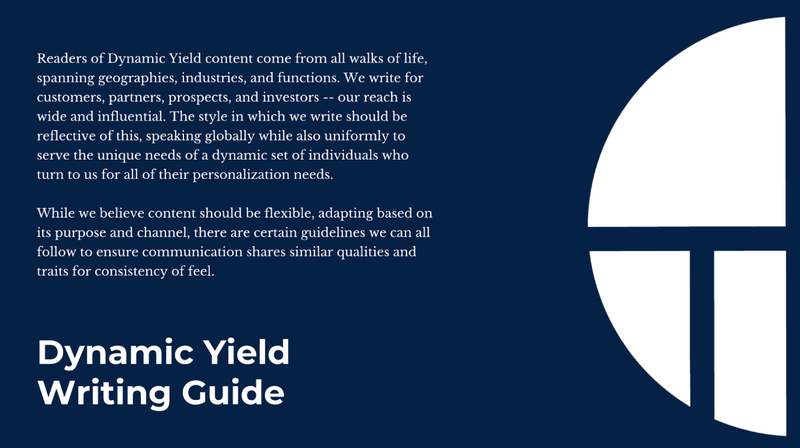 Find Dynamic Yield’s complete style guide, here. What you might consider the boring stuff, on a very basic level, these act as rules for an organization to live by and needed to be outlined before anything else. Personally, what I found most interesting in thinking about all of this, is how much of what I learned in college has gone out the window since working in digital marketing. In our world, it’s not strictly APA, MLA, or Chicago style anymore (and it hasn’t been for a long time, *sigh*). It’s a mixture of everything – we adopt ways of writing from a variety of sources, much of which is influenced by other online publications and outlets. Because people don’t consume content on the web like your college professors preferred your essays. That’s why if you want to stand out from the crowd (or simply fit in, whatever your prerogative), you need to establish what style you subscribe to. Doing so is directly tied to the experience your audience has with your content. ✎ Place periods within quotations if used at the end of a sentence. ✎ Use the Oxford (or serial) comma as the final comma in a list of things. ✎ Rely on a colon (rather than an ellipsis, em dash, or comma) to offset a list. ✎ Sparingly adopt the ellipses to indicate we’re about to finish a thought, not for drama. ✎ Hardly introduce exclamation points, and never more than one at a time. ✎ Opt for an em dash (—) as opposed to the semicolon. This is the essence of who a brand is through written word, and is one of the hardest pieces to iron out. It must incorporate both the characteristics which make up an overarching personality, one that remains consistent throughout communication, as well as elements of voice that should fluctuate according to context and situation. So, how on earth does one determine who they are and what to convey to those who interact with them? It can be a pretty subjective process, but in order to avoid any superfluous versions of your voice and tone, it’s critical to exercise due diligence. Answering questions such as these involves a deep level of assessment. I liken it to scanning the room in a social situation – who would you most enjoy entertaining a conversation with and who would you want to avoid? Obviously, our job as marketers is to, dun dun dun, market ourselves, so there will always be an element of self-promotion and persuasion, but an important realization to make is that the person on the other end of our messages literally doesn’t owe us anything. What you say and how you say it, therefore, should largely stem from the audience you’re ultimately engaging with. Addresses others as a well-respected colleague or friend, engaging in natural conversation while speaking with competence on any given topic or subject at hand. Always attempts to embrace positive rather than negative language, avoiding words like “can’t,” “don’t,” “never,” etc. that are not constructive or conducive to conversation. Efforts to connect are purposeful, offering actual value while cutting out the clutter so the recipient doesn’t need to work hard to get to the point of what is actually trying to be said. Acts as a source for guidance by sharing information of the highest quality – it’s dependable and reliable, so much so that others can take it at face value. The systems of belief that permeate throughout an organization are often implicit – attitudes, behaviors, and mindsets cultivated by management, processes, environment, goals, expectations and, dare I say… language. But when you want to change how a company uses language, those belief systems need to become tangible and explicit. A great way to accomplish that is by creating or updating your brand’s deck or handbook on culture. On every page or slide lies an opportunity to not only implement and reinforce a fresh style of communication but also renew the values which matter most to the brand itself. An asset such as this has the potential to touch and influence so many individuals – it instills a sense of meaning for current employees, assists in orienting new hires, aids in the decision making process during recruitment, and distinguishes a brand from its competitors while prospecting. The impact of your new linguistic identity, compounding. We practice what we preach and value versatile experiences. We don’t believe how we communicate has to be static – we’re a team of global individuals serving companies with unique needs in a rapidly evolving field. And for us, personalization is the universal language binding everything we create together. Our personalization platform thrives on data in order to deliver the most personalized experiences possible and so do we. The proof is in the pudding and we use it to drive all of our initiatives, from the features we provide to content you experience on our site, and even how we nurture relationships with our customers. Personalization may be trending, but for us, it’s more than just a phase. Customer experience is forever, and that’s why our contribution to the space has to be meaningful, speak to the times, and add value in a burgeoning field. In everything we do, all of the resources we develop, our work is well-researched, vetted by experts, and created with purpose. It’s one thing to document a style guide and revise the company culture deck, but an entirely different beast to roll out that language across web, social, email, and more. There is a lot of text to replace in all of those different locations, let me tell you. But whatever work is completed up until this point is rendered useless unless all public facing properties align with the new set of guidelines put in place. This is where your brand’s story comes to life – each channel, an outlet for individuals who wish to learn more about you, go to understand and get to you know you. And with limited attention spans and constant distractions, experiences like this are all happening very quickly, and often in fragments, meaning the information in front of them being processed at any given moment is so important. To ensure the first impressions and ongoing associations made with your brand are positive ones, each word has to count. Businesses are increasingly selling into global markets, employing local representatives, and opening regional offices to serve the unique needs of the customers who operate there. For these teams, success heavily relies on access to properly translated brand messaging. A task that requires language be flexible enough to reflect the patterns and elements used in various parts of the world – and that there’s enough of it. One-off pieces of collateral here and there are simply not enough to establish thought leadership, increase brand awareness, and nurture relationships. The diversification of language in and of itself communicates a sense of understanding, empathy, and appreciation for different cultures and communities. Versioning your website and content into French, German, Russian, Spanish, and so on ensures those who may not speak your native tongue fluently are able to gain pertinent information about your brand and interpret you as you want them to. People from the different geographies we serve are spending time more with us, engaging with more of our content, requesting to speak with us on a more frequent basis, and are even coming back to the site more often. Of course, I can’t attribute 100% of the improvements we’ve seen to the investment made in language, but I am hopeful and feel optimistic about its impact. Though, only time will tell what the long-term effects may be. It’s certainly not an opportunity one gets every day, but I strongly urge anyone who is reading this to spend more time thinking about the words they use and how intrinsically tied they are to a brand.